The International Stroke Conference 2018 — being held a month earlier than normal, Jan. 24-26 at the Los Angeles Convention Center in California — will bring together thousands of renowned scientists, researchers, healthcare providers and other professionals. 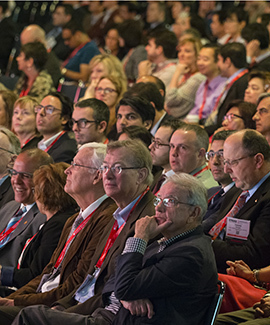 The world’s premier meeting for stroke science and care will offer more than 1,500 presentations related to prevention, diagnosis, treatment and rehabilitation to inspire attendees. The programming emphasizes basic, clinical and translational sciences as they evolve toward a more complete understanding of stroke pathophysiology to develop more effective prevention and treatment. Conference sessions will include outstanding debates, invited symposia, oral and poster abstract presentations, and special lectures on recent advances and state-of-the-science technologies. Don’t miss the latest trial results from some of the most exciting clinical trials in the stroke field, including DEFUSE 3, PRISMS, COMPASS, PHAST-TRAC, THRIVES, EXTEND-IA TNK, CASSISS and ARISE II. The State-of-the-Science Stroke Nursing Symposium is a can’t-miss forum for nursing, rehabilitation and other healthcare professionals who treat patients and families in all phases of stroke treatment. The ISC Pre-Conference Symposium I: “Stroke in the Real World: There Will Be Blood: Management and Treatment of ICH” will highlight scientific advances in intracerebral hemorrhage while emphasizing application in the real world. The ISC Pre-Conference Symposium II: “Stroke in the Lab World: Reversing Stroke Translational Research — Bedside-to-Bench and Back Again” will address challenges facing traditional “forward-translation” stroke research. In addition to the outstanding science, the International Stroke Conference presents a vibrant exhibit hall — the Science & Technology Hall. Make time in your schedule to visit with the more than 90 exhibitors who will be showcasing the latest products and services tailored to all aspects of cerebrovascular disease and treatment. Register today for ISC 2018 and enjoy a discounted rate until Jan. 2. We hope you’ll join us next month at ISC 2018.